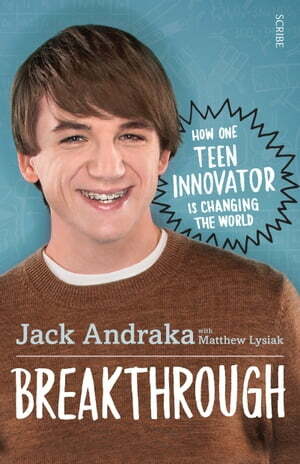 Collins Booksellers - Breakthrough by Jack Andraka, 9781925307207. Buy this book online. Have you ever had a problem you would give everything to solve — a problem so difficult you would spend years searching for a solution? When Jack Andraka was thirteen, he had a whole pile of problems like this. An outsider at school, he knew he didn’t fit in — and a close family friend was dying of cancer. But instead of giving in to the bullying and the despair, he took another path. Using his passion for science, he decided to try to create a better method of cancer detection. After conducting two years of research and asking hundreds of universities and companies for help, to no avail, Jack was finally able to secure the lab space necessary to test out his ingenious idea. In the end, he did it. Jack’s early-detection test for pancreatic, ovarian, and lung cancers has the potential to be over four hundred times more effective than the medical standard — and it costs only three cents per use. Jack was just fifteen at the time he came up with his solution. Jack Andraka’s story is not just one of inspiring teenage success; it is a story of overcoming depression and homophobic bullying, and of finding the resilience to persevere. Whatever your age and interests, his book will motivate you to pursue your own dreams in the face of resistance, and to never stop learning. Full of fun, simple experiments you can try at home, Breakthrough is an amazing personal story and a reminder of why young people’s ideas deserve to be heard.